Once again, Dave explains! 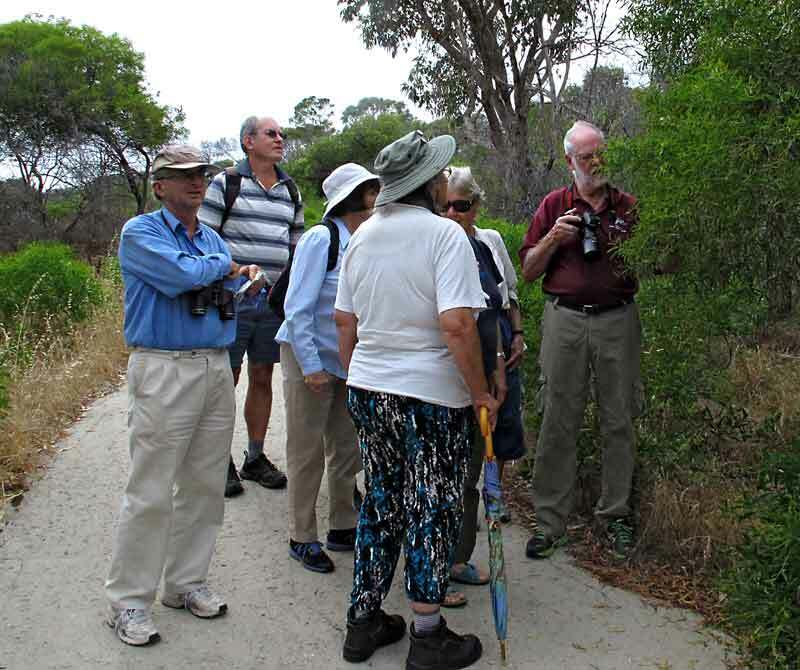 Here we are looking at re-growth in one of the areas burnt in January 2012. The annual weed growth is very strong, but fortunately dying off now. Under examination is a Scaevola – either crassifolia or nitida, both of these Fanflowers are present in Trigg Bushland, in bloom. 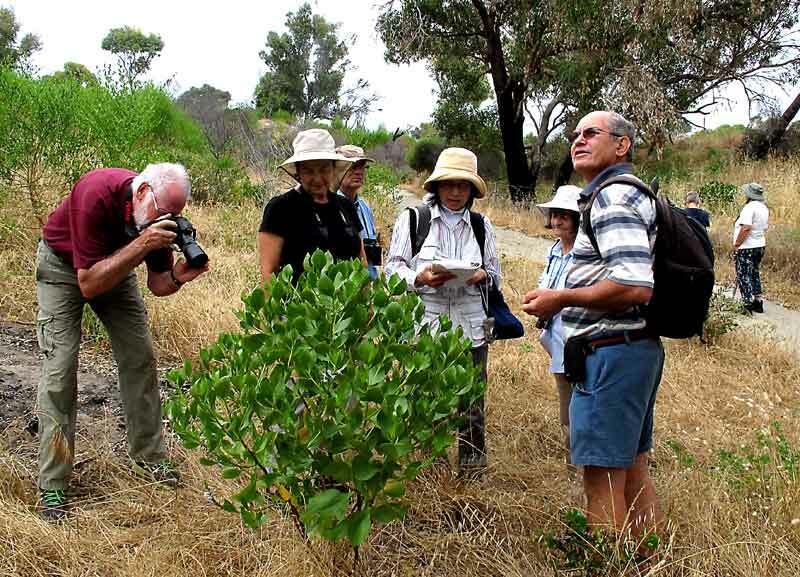 Phylis won the prize for spotting the first Trachymene pilosa (Blue laceflower, Rottnest Island Daisy), looking spectacularly bright and fragile even though the bush was already drying off… the Trachymene was just starting! There were some fine displays in small areas. 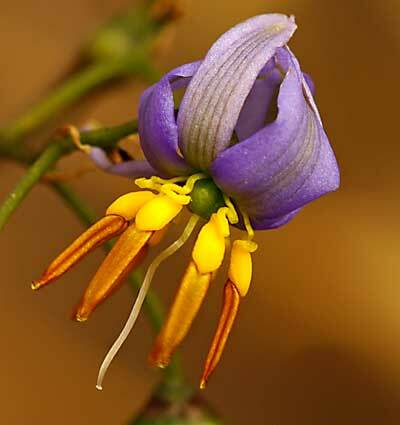 Dianella is still blooming, and in this photo you can see the spring-loaded stamens… ready for buzz pollination. 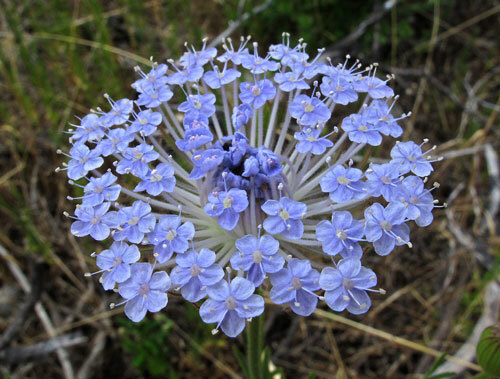 (Watch a movie of these flowers being pollinated on the Australian Museum website!) Dianella revoluta photo I Johnson. 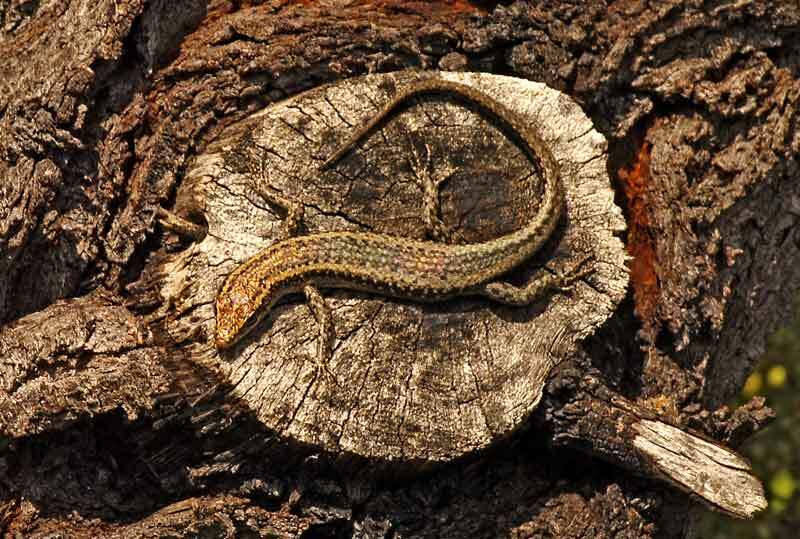 This little skink was having a sun-bake on a tuart tree. Probably Cryptoblepharus buchananii – Buchanan’s snake-eyed skink. Photo I Johnson. Ian spots something very small, but completely amazing…. 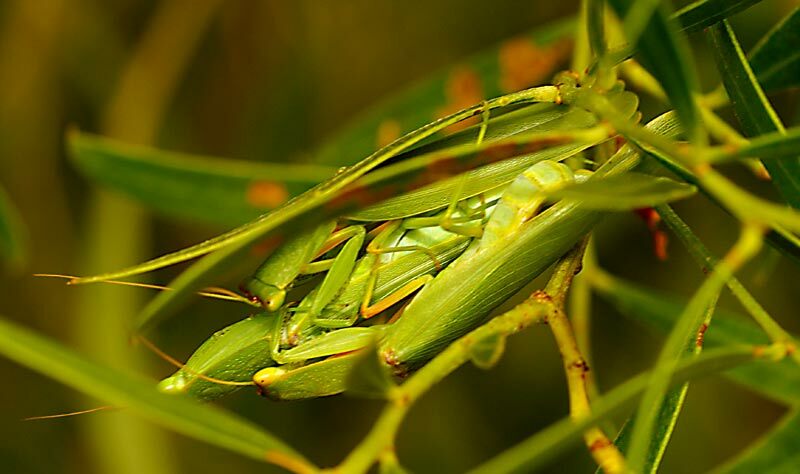 A Praying Mantis trio, sandwiched between acacia leaves.. Photo I Johnson. 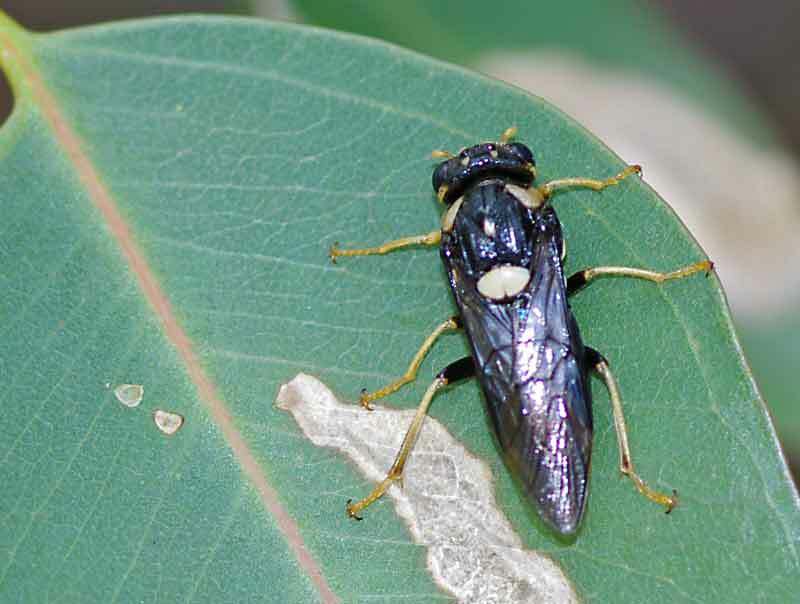 This is the Steelblue Sawfly – Perga dorsalis – on a tuart leaf. It is actually a wasp, not a fly. The female lays her eggs in a slit she cuts in a leaf of a plant that will be a food source for the larvae, often a gum tree. The larvae are commonly called spitfires, and are often seen in a writhing mass. The larvae and adults of this family are quite harmless to people. They do not sting, as their cousins the communal wasps do. Look at the two hooks at the end of each leg… she is quite secure on the leaf! Photo I Johnson. 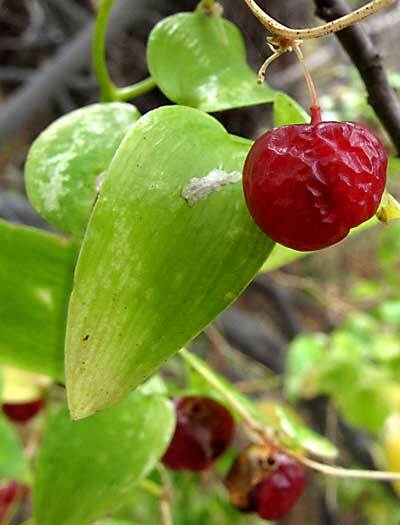 A berry from a dangerous weed, Bridal Creeper. You can see a fungus discoloring the leaf of the Bridal Creeper. This is an introduced biological control for Bridal Creeper, and while it does not kill the plant, it severely restricts its growth. Otherwise the bush would be completely covered in Bridal Creeper, which can completely smother whole plant communities, including trees. More about bridal creeper rust fungus at the CSIRO website.